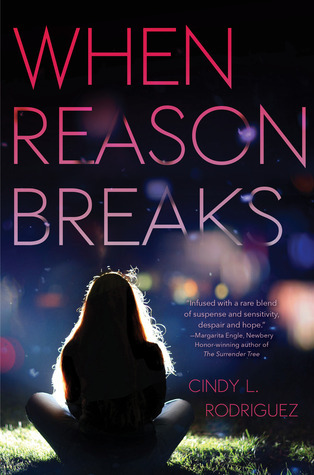 Sweet Sixteener Ashley Herring Blake recently spoke to Fearless Fifteener Cindy L. Rodriguez about her YA contemporary debut novel, WHEN REASON BREAKS (February 10, 2015 from Bloomsbury). Cindy L. Rodriguez is a former newspaper reporter turned teacher and fiction writer. She has worked for the Hartford Courant and the Boston Globe, and now works as a middle school Reading Specialist. She is a big fan of the ocean, chocolate, coffee, and coconut ice cream. Her number one loves are her eight-year old daughter and her three-year old rescue mutt. She lives in Connecticut. Find Cindy on her website, Twitter, Facebook, and Goodreads. A Goth girl with an attitude problem, Elizabeth Davis must learn to control her anger before it destroys her. Emily Delgado appears to be a smart, sweet girl, with a normal life, but as depression clutches at her, she struggles to feel normal. Both girls are in Ms. Diaz’s English class, where they connect to the words of Emily Dickinson. Both are hovering on the edge of an emotional precipice. One of them will attempt suicide. And with Dickinson’s poetry as their guide, both girls must conquer their personal demons to ever be happy. In an emotionally taut novel with a richly diverse cast of characters, readers will relish in the poetry of Emily Dickinson and be completely swept up in the turmoil of two girls grappling with demons beyond their control. WHEN REASON BREAKS is available for purchase at Amazon, Powell’s, Books-A-Million, Barnes & Noble, and Indiebound. Ashley: Each character in WHEN REASON BREAKS represents an iconic piece of the poet Emily Dickinson. How did you come up with this idea and what process did you use to break her up into different people? Cindy: I hadn’t read much of Emily Dickinson’s poetry or about her life until I took an author-centered graduate class in 2006. Both she and her poetry are fascinating and complicated. For that class, I wrote three twenty-page papers and another ten one-page responses to her poetry. I wouldn’t call myself an expert, but through that work, I was able to deeply examine and appreciate her life and work. Around that same time, I had mental flashes (you know, like the movie in your head kind) of a scene that would become part of chapter one—a teacher running in the woods toward a student who needs her help. Since the Dickinson class and these images were happening simultaneously, I decided to merge my novel idea (in its infant stages) with the life and poetry of Emily Dickinson. When thinking what would she be like today? 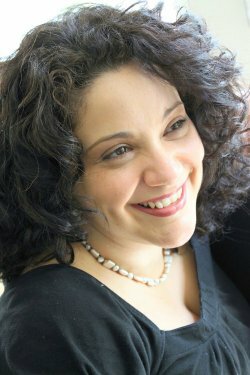 I felt the need to divide her into three people who would embody different aspects of her life and personality: Emily Delgado, who becomes increasingly reclusive and depressed, Elizabeth Davis, who represents her angrier, Gothic poetry, and Ms. Diaz, the intellectual who reveres the written word. Ashley: Suicide plays a large role in the novel. What inspired you to include this in your main characters’ struggles? Cindy: I decided to include a suicide attempt for a few reasons. Both Emily and Elizabeth struggle with depression in different ways, and while not all depressed people attempt or commit suicide, for many, suicidal thoughts, self-injurious behavior, attempts, and suicide are real, potential results linked to their mental illness. To delve into depression and not go there would have felt disingenuous to me, especially with teen protagonists. Suicide is the third leading cause of death for people aged 15-24. Beyond that, I’m a teacher who has seen scars on students’ skin. We have lost students in our district to suicide. I have spent many lunch hours talking to teens who needed someone to listen. I have sometimes shared with them that I, too, have been depressed. I know what it feels like to drag yourself through the day and wonder if things will ever get better. I have told them something I included in the novel, that even in the darkest of times, there is always hope. Ashley: When you begin a novel, what drives your ideas? Do you start with premise, character or setting? Cindy: Often, I’ll read something in the news or online, a nugget of nonfiction, and this will get me thinking. With this novel, it was the life and poetry of Dickinson. With Book 2, I learned about the last days of Aesop, the fable writer, and was fascinated by that. Recently, I fell in love with a news story about a wolf, and at school one day, I learned Connecticut has experienced a series of mini-earthquakes over the years and local residents link these to an old witch story…Hmm…These types of things spark my interest. So, I guess I start with a premise and then let it unfold through brainstorming, planning, and visualization. When I start to “see” and “hear” them in my mind, then the characters and setting become real. Ashley: When did you know you wanted to be a writer? Can you tell us a little about your journey to publication? Cindy: I have always loved to read and write. I wrote a couple of novellas in my teen years, and my sister and I always paired up for school projects. She did the artwork and I did the writing. When I went to college, I double majored in journalism and English, and while I loved literature, I pursued a career in journalism and then teaching. I didn’t really think about writing a novel, or believe I could do it, until I planned out and then wrote the first draft of WHEN REASON BREAKS. It took me three years to write because I was working full-time and became a new, single mom to my amazing adopted daughter. Once the novel was written, I landed an agent after a few months of querying. After some revising, the manuscript went on submission and stayed there for….wait for it…two years!! We had a couple of close calls, but it just didn’t happen right away. My agent was persistent, though, and we eventually found the right home for it at Bloomsbury with an editor who loved the story as much as we did and whose revision notes made all the sense in the world. It was a long, long wait, but it was worth it. While I waited, I wrote Book 2. That would be my advice to others going through this process: keep writing. What is your favorite Emily Dickinson poem? One of my favorites begins: “Unable are the Loved to die / For Love is Immortality” It’s in the novel and on the back cover. What were you reading when you were sixteen? I started college at sixteen, so I remember doing more required than independent reading. One of my freshman professors was big on Nathaniel Hawthorne. That summer, I remember reading THE CATCHER IN THE RYE and LORD OF THE FLIES because these were referred to often and I hadn’t read them in high school. Character in WHEN REASON BREAKS with whom you identify the most? Emily because of her type of depression, more organic than triggered by a specific event or tragedy, and Ms. Diaz in the classroom scenes. Those were easy to write after almost fifteen years of teaching. You get to revive three dead authors for a party. Who do you invite, other than Emily Dickinson? Maya Angelou, Emily Brontë, and Piri Thomas. Band you liked at sixteen that you still listen to? 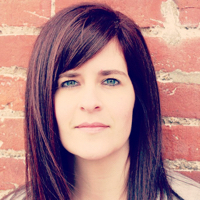 Ashley Herring Blake is former singer-songwriter and teacher turned YA writer. She has a Master’s degree in teaching and lives in Nashville, TN with her husband and two sons. When she’s not writing, she can be found under a pile a books listening to gloomy music. In her YA debut, SUFFER LOVE (Houghton Mifflin Harcourt, Spring 2016), two teens attempt to wade through an intense relationship complicated by their parents’ infidelities.